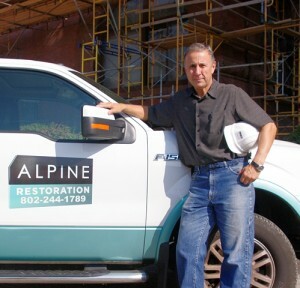 Established in 1992 by Bruno Gubetta, Alpine Restoration & Construction began humbly with small residential projects in historic homes. The young company quickly established a favorable reputation in Vermont, and as a result, were awarded larger commercial projects. 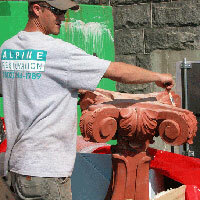 Once recognized by some of Vermont’s most respected designers and architects, Alpine became one of the most sought-after masonry restoration companies in New England. In 1978, he also became a Master Mason, and then a principal partner in a well known Toronto restoration company. The company’s largest project, the Toronto SkyDome, schooled him in cutting-edge construction. The massive undertaking also gave him first-hand knowledge and know-how in meeting deadlines and demands of large-scale projects. Today Bruno’s passion for historic building preservation in Vermont and a dedication to excellence have earned him the coveted position as Vermont’s preferred Master Mason. His team — also qualified masons or trained craftsmen — take pride in their attention to detail. The company’s philosophy has proven crucial in time sensitive and historic projects. Bruno’s personal interests include a life-long dedication to health and fitness. As a veteran skier in Vermont, he is a past Chairman of the Board of Examiners, PSIA Eastern Division, and Eastern Demonstration Team Member. He is also a highly skilled mountain biker and road cyclist. Bruno is also a commercial instrument pilot in fixed wing and helicopter aircraft. He shares his talent with his son Kris, also a commercial pilot. Bruno resides in Waterbury with his girlfriend.